All of the courses offered are NCBTMB approved and Florida approved for continuing education for LMTs and Acupuncture. This premiere, 108 Hour interactive experience is one that will both inspire and heal you. 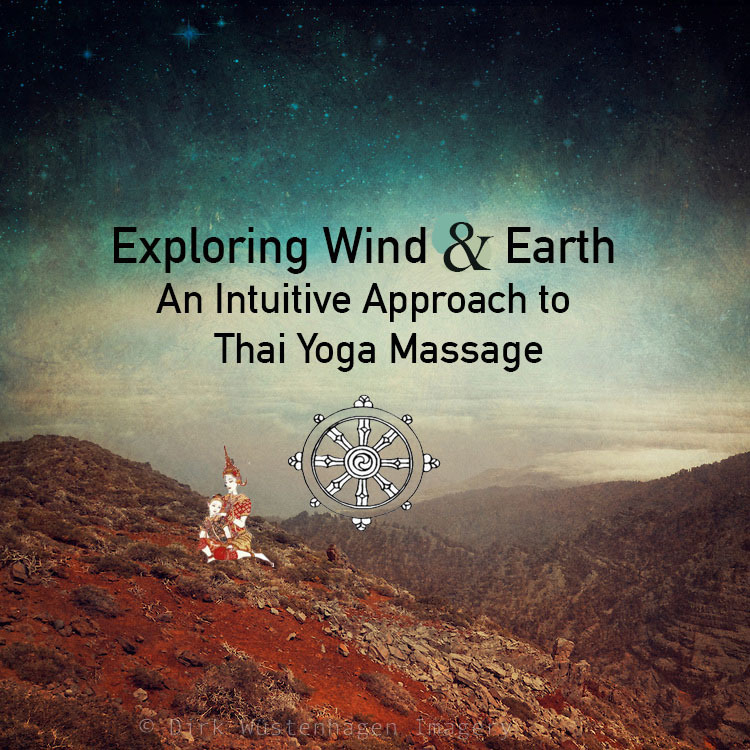 Emphasizing the art of being a witness and compassionate, healing touch, we will explore the core movements, stances, hand techniques and rooted breath awareness necessary for a strong foundation in the Thai Massage practice. This advanced training in Thai Massage and Ayurveda will be offered in six consecutive months throughout the year. One weekend a month will specialize in a different aspect of the art. Feel free to click on any individual workshop to learn more about what is experienced in each one. Descriptions of our curriculum are also located below. While it takes more then a weekend to truly develop a strong foundation and to honor the intricacies of the art, one may begin at any time during the 6 month period and attend as many or as little sessions at will. It is easiest to begin with Thai 1: Introduction to Thai Massage, but starting at any level has its specialty. 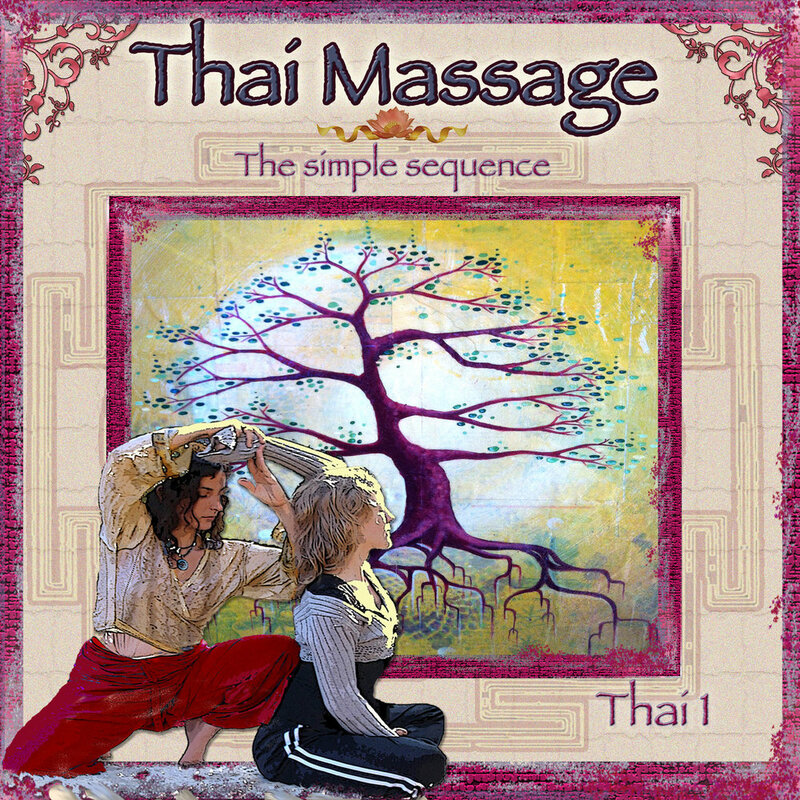 Many students with a prior massage practice begin with Thai 1 or Thai 6. Each weekend training is 18 hours, 9:00 a.m. to 6: 00 p.m. on both Saturday and Sunday and is located at the Florida School of Massage in Gainesville, FL. and Jai Dee in Tampa. This certification is approved by the Florida and National Board of Massage. Thai Massage for knee Pain using Roller and Warm Oil. $1350 if registering for all six levels in advance (book included). $1500 for students that are able to commit to attending all six classes within 1 year from the first class taken (book not included). This option allows the students to pay $250 for each individual class. $300 if registering for each class individually (book not included). Current FSM students are discounted 30% only while in the program. For a detailed course description for each level please visit 'course descriptions' to register online for one or all the classes click HERE. At the end of completing all 6 levels you will receive a certificate of completion. Contact Ariela if you have any questions or need support in seeing if this program is right for you. Held only once per year, once in Florida, this certification covers not only the full spectrum of massage workshops that are offered , but includes optional lifestyle practices like daily meditation, karma yoga, asana, pranayama, and more. Connect with your sangha and yourself in a way that you never have before with what has been dubbed by past participants as "THAI CAMP." This program is perfect for practitioners who need a change of pace from their daily lives or who live out of state. Tuition includes the teaching and all materials. 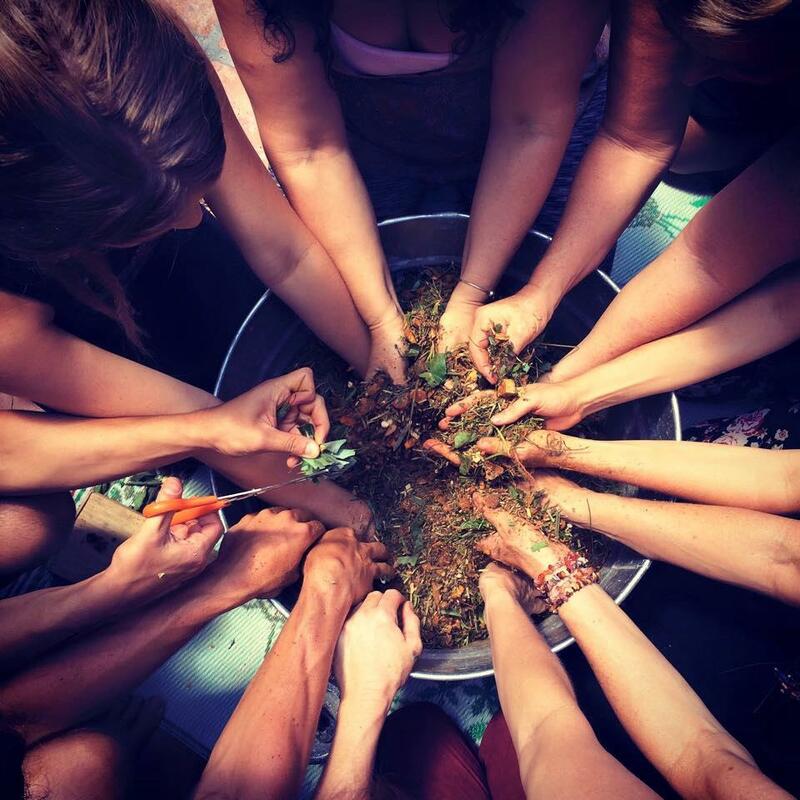 The experience includes group meditation, contact improvisation dance sessions, trips to the farmers market, and engaging classes and discussion. *It is expected that each participant contributes to the well being of the space with regular karma yoga practices including but not limited to cooking, cleaning, gardening, and more. We have cats that assist in all activities in Florida. Please note that food, transportation, and additional books are not included in tuition. The "Big Yellow Book" is included. Offered as a week long herbal immersion or a 6 month Sunday experience, Thai Herbal Bundle Therapy is a multi-therapy massage treatment, combining traditional Thai Massage, aromatherapy, and herbal healing. This class will demonstrate a massage therapy that dates back several thousand years, and incorporates knowledge gathered and passed on for generations concerning the medicinal effects of plants, whether through ingestion or application to the body. In Thailand, the herbal compress is called luk pra kob ("herbal pressing sphere"). In the U.S. it is referred to as an "herbal stem" or "herbal ball". 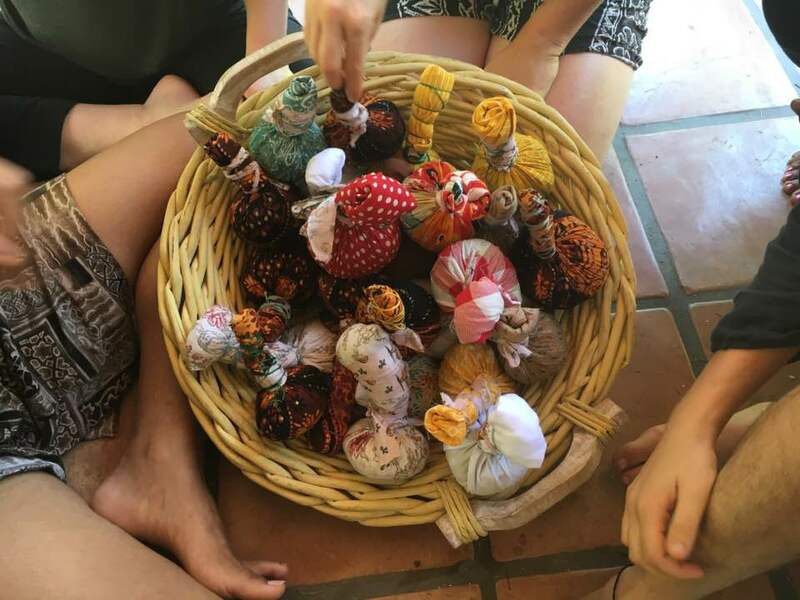 An herbal compress is made by combining a number of healing herbs, bundled together in a muslin ball with a short handle, according to ancient recipes. Originally, this herbal therapy was designed to reduce pain and inflammation, especially for soldiers after battles and for postpartum women suffering the after effects of childbirth. Nowadays, the application and massage of these compresses to the body are used more generally to relieve all types of aches and pains, be it from physical labor, exertion, or simply the stresses and strains of modern living. The compresses contain a blend of aromatic and therapeutic traditional Thai herbs – up to 15-20 herbs – wrapped in cotton muslin and then steamed to release the potent qualities of the herbs, which impart both a relaxing and an invigorating effect on the mind and body after application. It is a beautiful addition to the traditional sequence and adds a deeper healing for acute and chronic imbalances of the body and we are pleased to offer TWO paths of study, our 1 week herbal immersion or our 6 month Sunday program where we meet one Sunday each month. Meet 1 Sunday out of the month . Learn a new treatment with Folk Medicine and common & traditional herbs. *Day 1- Make a bundle and give a full 1 hour spa style session. *Day 2- Learn to treat a headache of varius degrees. Day 5- Shoulder pain and accute to chronic treatmemt with use of oils and cupping. *Day 9 - Pregancy protocol - Can als be used for elderly massage. While part of an overall program, all of our courses stand alone as individual courses. You are welcome to join us at anytime during our programs and start your Thai journey. We recommend Thai 1: Introduction to Thai Massage as a great place to start, but we also believe that you will join when and where you feel most called. 18 CEs for LMTs and Acupuncture. Over the course of this first workshop, students will learn an hour and a half long form. Practiced on the floor, this form enables the therapist the use of elbows, knees, forearms and feet in a comfortable and efficient way that utilizes the body dynamic and ones own weight to distribute the force required for the application of the relevant techniques. The recipient lies relaxed and loosely clothed while the practitioner guides them through a series of yogic asanas and applies balancing touch to the body’s major energy lines and points. Thai Massage is an art whose ultimate objective is a perfected self-awareness through the joy of a mutually beneficial healing dance. Level 1 provides the necessary foundation for future techniques to be based upon, but also can serve as a stand alone practice, in and of itself, as students will learn a complete form during this class. This workshop is intended for those students who have already familiarized themselves with the Thai Massage practice through taking Thai 1, and are now ready to deepen their knowledge and widen their vocabulary. We will extensively review the Thai 1 material, both strengthening knowledge of the form itself and deepening awareness within the exercises, in order to bring our consciousness to a more subtle level during the healing process. We will also be focusing on variations of the previously learned exercises in order to widen our palette and allow ourselves more options when cultivating an individualized session tailored to a client's particular needs. As students participating in this class will already have some familiarity with the form we will be able to focus on deepening the knowledge we already possess and enabling more advanced techniques to arise. In Thai 3 we will be exploring advanced poses for those students already possessing a firm grasp of the basic material as taught in Thai 1 and 2. During this class we will be both learning and exploring more complex poses and techniques (inversions, back bends, advanced footwork, etc.) while also taking our awareness to a deeper place within seemingly simple touch. In this course we will be refining our diagnostic abilities and increasing our external means of co-creating an individual session tailored to the recipients level of flexibility and particular needs. We will also be taking a more proactive approach in cultivating the improvisational movement so necessary to being free within the form. In this class we will again increase our healing vocabulary while learning to be more present in our moment. It is generally accepted in learned circles that the earth itself possesses energy lines. Likewise the human body is also comprised of pathways for various kinds of energy and information. Different disciplines and cultural traditions portray their location and means of access in alternate modalities and varying descriptions. The system we will be exploring during this class is a descendant of a synthesis of India’s Ayurvedic medical healing art and China’s meridian methodology. In Thai Massage we cultivate an awareness of the “sen” lines and practice various techniques with the intent of bringing them into balance with each other. When the energy lines are brought into balance, harmony, health and equilibrium are the result. Knowledge of the Thai energy line system was nearly lost to us. Two of the greatest practitioners of our time (Asokananda, Kam Thye Chow) pieced together fragments found in various Buddhist temples around the world, and together have co-created a modern interpretation of this ancient knowledge. At this stage in the deepening of our skills and awareness of the present we will honor the continuation of the Thai Massage lineage through extending our conscious knowledge and encompassing a more subtle comprehension of the bodies energy pathways. Traditionally, in classical Thai Massage, the recipient assumes either a sitting, prone, supine or side line position. Of these postures a strong working knowledge of sideline and it's applications can be indispensable, particularly for working with pregnant clients, or those for whom lying on their stomach is uncomfortable or not possible. In this workshop we will modify all the material previously learned to accommodate these needs. We will also undertake a stronger and more detailed knowledge of the energy lines in the side position and we will learn to apply different stances for different lines, customizing them to the individual needs of the client. In this fifth level training , we will apply knowledge previously gained while learning to trust in our intuition through the application of Ayurvedic principles. In this stage of learning, we will primarily be applying energy through the use of our feet and developing the sensitivity, balance and agility that naturally extends from this technique. With some emphasis being placed on the mutual source they share, we will explore Hatha yoga principals within the context of Thai Massage and utilize this knowledge in the shared benefit of recipient and practitioner alike. Thai Yoga Massage on a table expands your business to a whole new clientele while helping to take even better care of your body. Performed on a low table with a fully clothed client, Thai Yoga Massage will allow you to reach out to a mainstream audience, including athletes, the elderly, and people who prefer massage on a table. It brings the benefits of Thai Yoga Massage, including customized yoga, profound relaxation, and energy work, to the comfort of your massage table. Therapists used to traditional table massage will reduce injuries to hands and wrists by learning to use elbows, forearms, feet, and other parts of the body. Those used to Thai Yoga Massage on a mat will find they can massage in greater comfort. These workshops are not part of our traditional 108 certification but can be counted as part of it for advanced students. All of these workshops can be counted as CEU's and are welcome to the public whether you have studied Thai Massage or not. Work on a table or mat! We will learn the 10 Sen lines used by Lotus Palm and Sunshine Network . This class is sometimes referred to as the 7th phase, due to the 4th phase not being quite long enough to fully grasp the experience of this field. In this weekend workshop we will be completely dedicating our time to locating each line, feeling the unique quality of each line, and visiting the pressure points located on them. 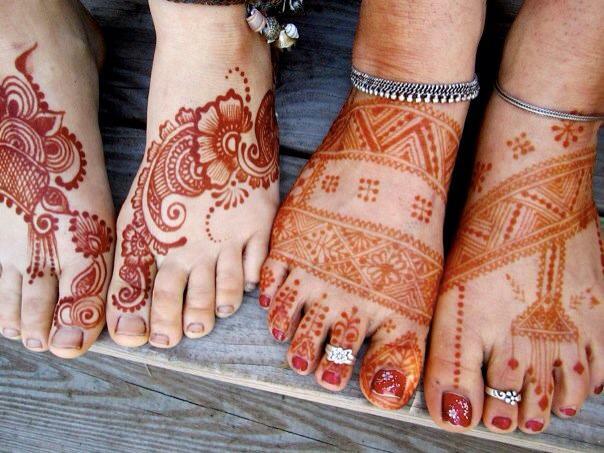 We will draw on each other, sing songs about the lines and spend a beautiful weekend becoming more solid on the etherial aspects of Thai Massage. In this weekend workshop, we will break down the classic Hatha Yoga sequence as taught to Ariela by the Sivananda School of Yoga in South India, and we will add her many years of experience as a Thai Massage teacher to help deepen the postures. Every asana will be demonstrated for the practitioner to feel the essence of the posture and then we will use Thai Massage techniques to shoot off the energy lines and help develop a deeper awareness through assisted stretching. We will practice a full Sivananda sequence for different constitutions. * Each asana will be broken down and explained as to the therapeutic benefit. * A Thai Massage assist will be shown for each posture. *Awareness and practical use of Pranayama will be shared in each posture and as an assist in deepening. In this workshop students will learn to give an hour long session on the feet alone, while still affecting the whole body through aware stimulation of the sen lines and marma points. Utilizing both dry and wet massage (with and without oil) as well as a Thai foot stick, to glide the lines and press the points with greater accuracy and precision then the hands alone could provide. The style we will be exploring is a method derived from Shivaga Komarpaj of the Chiang Mai school of Thai Massage, and is for everyone, therapists and lay people alike. This is a powerful healing tool that can be implemented on it's own, or as an addition to the full body massage. No prior massage experience is necessary to be educated in this methodology. In Traditional Thai Massage, one aligns the body through stretching the entire structure and working the lines and points, according to the individual's needs. The session works physically, emotionally, energetically and spiritually, bringing balance to the whole being. The nature of Thai Massage is to BALANCE the energy bodies. If you are tired, it will awaken you and if you are nervous, it will calm you. Four handed/footed -Double Practitioner Thai Massage is founded on the same principles as Traditional Thai, but it is inspired by its Ayurvedic cousin, Abhyangha Massage, which is performed by two partitioners. It has been my experience, that when receiving Thai Massage by two practitioners at the same time there is a sense of losing control and total surrender. In this class we will learn a sequence that was developed by Ariela. It holds the foundation of the classic sequence but is synchronized to function with duality. The two practitioners work in harmony, mindful and attentive to the breath as the inward/ outward stretches are congruently done in a harmonious mindful union. Students will learn to give an hour-long sequence, learning both parts, (upper and lower body) and will have the confidence to offer a sensational Double Practitioner session. Thai Massage is an observation of the elemental body and an attempt to bring balance to the properties witnessed. In this unique class we explore the 4 directions throughout the body while offering simple stretching. We can then intuit or ask which of the directional movements would be of most benefit. This is the exploration of the Wind element. We practice presence. Within this presence we notice and are curious. The act of curiosity and love brings intuition. We hold space and watch change through the breath.